Graduate student Ricardo Perez-Alvarez checks cabbage plants for insect pests. A cabbage looper, a pest of cabbage plants. Landscapes that surround agricultural lands strongly influence the dynamics of beneficial insects as well as insect pests on farms, which in turn affect crop yields. Such were the findings of a Cornell study of New York farmlands, published April 4 in the journal Ecological Applications. Many previous studies on how landscapes surrounding farms affect insect pests and crops have only considered one pest at a time. 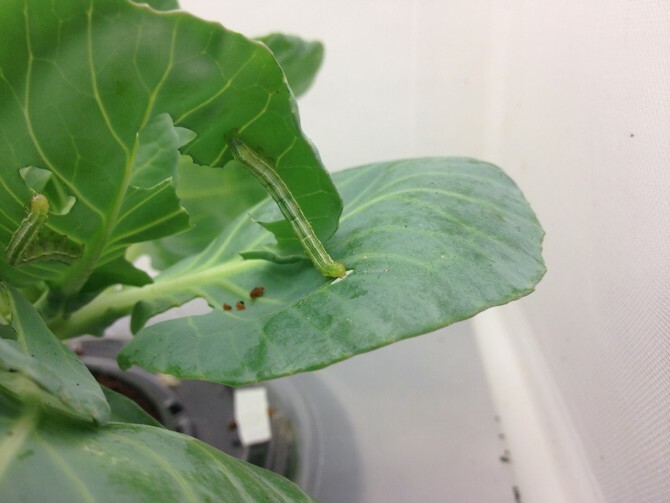 This study examined the effects of three cabbage pests – aphids, flea beetles and leaf-feeding caterpillars – wasps that feed on caterpillars, and crop yields. It also looked at three different types of landscapes that surround farms: agricultural lands, meadows and semi-natural areas (including shrublands, types of forests and woody wetlands). “By considering multiple insect pests, [our study design] represented a more realistic situation for what farmers experience, we were able to disentangle some of these complexities,” said Ricardo Perez-Alvarez, the paper’s first author and a graduate student in the lab of Katja Poveda, professor of entomology and the paper’s senior author. In the study, the researchers set up 22 experimental cabbage plots on farms across the Finger Lakes region of New York from June to September in 2014 and 2015. The details and management of each plot were the same, with no pesticides or insecticides used. Throughout the growing season, the researchers measured plant damage by each pest, density and abundance of parasitoid wasps, and they recorded crop yields at the end of each season. The researchers expected that landscapes with a higher proportion of cropland and lower habitat diversity would lead to more specialist pests and a reduction in crop yields, according to the paper. Instead, they found that yields and the number of pests were best explained by the presence of non-crop habitats, such as meadows, in the landscape. Specifically, when the proportion of meadows surrounding farms was high, the amount of infestation from cabbage leaf-eating caterpillars was lower, likely because of increased parasitism from wasps. On the other hand, these same plots experienced more infestation from flea beetles and aphids. The findings suggest that while some beneficial insects increased as a result of the non-crop habitats, so did the number of certain pests. By considering the collective effect of multiple pest species on crop yields, management schemes need to consider joint effects of pest species to be effective, Perez-Alvarez said. Still, more detailed study is needed to better understand these dynamics. “There were some landscapes where the presence of meadows can have an overall positive effect from crop production, but in other areas, meadows can have a negative effect,” he said, perhaps due to the characteristics of the insect fauna that live in those areas. “There is not a universal solution,” he added. Brian Nault, professor of entomology, is a co-author of the study. The study was supported by U.S. Department of Agriculture’s National Institute of Food and Agriculture via the Cornell University Agricultural Experiment Station.